It’s Friday! Here’s a little outfit inspiration for your Saturday night out this weekend. My friend is celebrating her birthday tonight and we just might be doing a little dancing! It’s been a while since I’ve gone on a ‘night on the town’ so I am super excited. Be sure to check back for photos of the new dress I’ll be wearing. 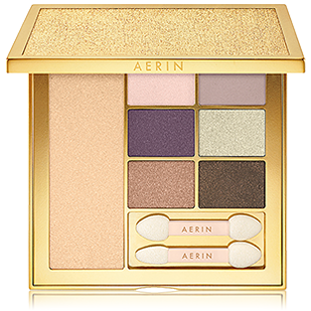 How gorgeous is this holiday palette from AERIN? Aerin Lauder is the grand-daughter of Estee Lauder and she has struck out on her own with her collection. It’s a pretty palette with all the essential colors. See the rest of the holiday collection here. 1. A structured bag from PLIA Designs (in beautiful Italian calf leather). Hm, time for another new work bag? 2. Fuschia (one of my fav colors) throw pillow from One Kings Lane. 3. Japanese brand Muji makes the best pens. They write very well and I always grab a few colors of these pens every time I visit Asia. 5. Colorful bonbon duo drop earrings from Baublebar.